Any serious gardener will love this little building. 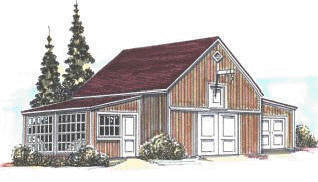 It has a big one-bay garage for a car, truck or SUV, a garage for a small tractor and garden tools and a 10' x 18' potting shed or greenhouse. Get your flowers or kitchen vegetables off to a great start with this practical backyard barn. Floor Area: 828 Sq. Ft., Storage Loft Area: 380 Sq. Ft.